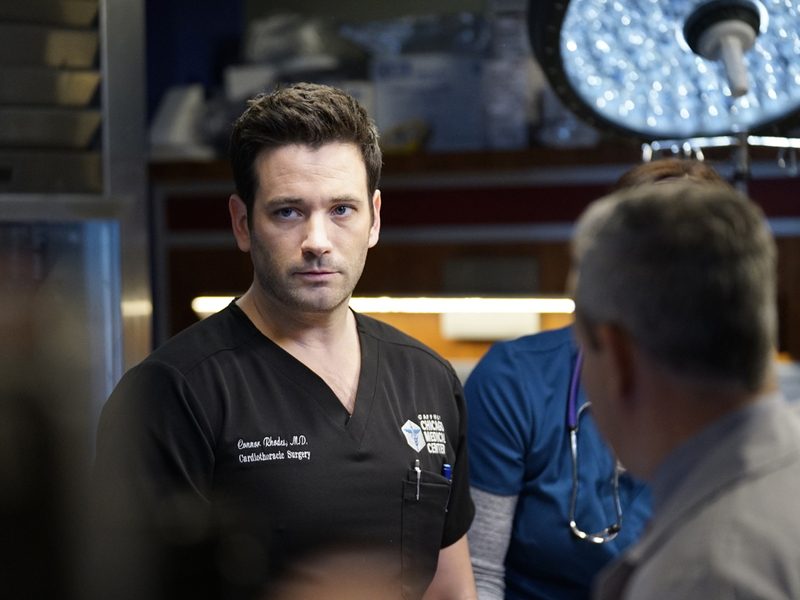 Parents, or at least the problems they cause their children, move center stage in the latest episode of NBC’s Chicago Med. “The Parent Trap,” airing at 10/9c April 24 on NBC, may sound like an ode to the Disney movie (and sequel) of the same name, but previews of the episode don’t suggest it will be a light-hearted one. In the exclusive sneak peek below, Dr. Connor Rhodes (Colin Donnell) once again is plagued by the actions of his rich father, Cornelius Rhodes (D.W. Moffett). This time Daddy Dearest seems to be romancing his son’s colleague, Dr. Ava Bekker (Norma Kuhling). Wait a minute? Didn’t she and Connor, um, get together already? Isn’t he kinda sweet on her, even though they always seem to be fighting? In the scene, Connor wants so badly to warn Ava away from his dad when she receives flowers from the older Rhodes, but he decides to hold his tongue. Connor gets in on another parent issue in the episode. The good doctor rushes to fix a heart that could save the life of Dr. Sarah Reese’s estranged father, Robert Haywood (guest star Michel Gill). Connor tells Sarah (Rachel DiPillo) she might want to say her farewells. Elsewhere at Gaffney Chicago Medical Center, Dr. Natalie Manning (Torrey DeVitto) and Dr. Will Halstead (Nick Gehlfuss) disagree on something—again. This time they can’t decide how to handle the parents of a 10-year-old boy who is admitted to the hospital. While parents seem to be the issue of the week on “Chicago Med,” dating (or not dating but were dating or will be dating—but always bickering) doctors always are an issue. Jeff Drayer wrote the episode and Jono Oliver directed. Aside from Michel Gill and D.W. Moffett, guest stars include Kara Killmer, Roland Buck III and Arden Cho.